I unexpectedly needed a blue jeans refresh for Fall & Winter - capsule was not looking sufficiently trendy. (Jeans are not the component of my style that I keep classic). Need higher rises, button flies, UNIFORM washes, and different silhouettes. Tucking, semi-tucking and short tops are key. Must be able to wear comfortable flat shoes, warm socks, and feel fab. Here is the first update. LOVE! 2. High Rise Levis Wedgie Jeans in VERY light blue for my light blue capsule (perfect match with my bag). Have tried the Wedgie before - not comfy on the crotch point - but this one fits very comfortably. LOVE the '80s vibe. Sized up a size. Very lucky with fits. Excellent lengths. No alterations needed. All jeans work with my 20,000 step booties so suit my urban walking lifestyle. On trend and practical. My denim update is COMPLETE, but my denim edit is not. I will pass on more than three pairs of jeans soon. Stay tuned. 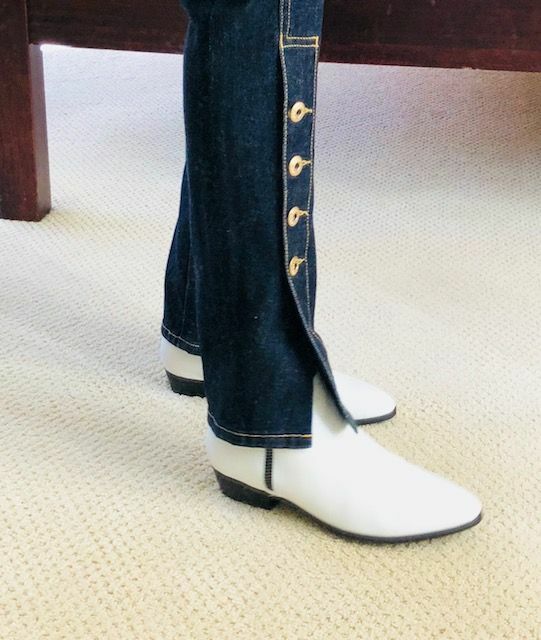 ETA: was going to add high rise bootcuts to wear with flats. That can wait till Spring. Love the new hoodie with the light blue on you! 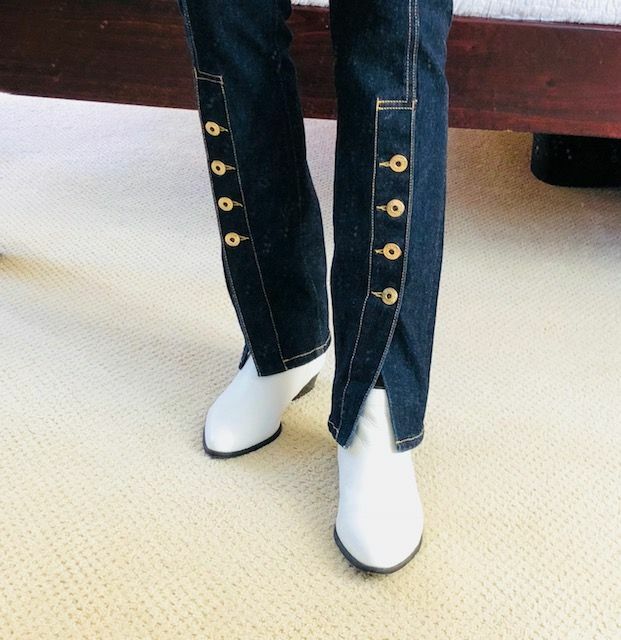 LOVE the Simhkai jeans on you, pure perfection! I wold be so tempted by them too if they didn't have so much gold. The other pair looks great, too. Congrats on completing your trendy jeans refresh. Thanks sweet Tanya, and unfrumped. The gold hardware is NOT subtle. You need to love gold to love them - which I do! These look so good on you. You could be a jeans model! Wowza!!! And nodding my head in agreement with JAileen, all the jeans look far better on you than the models. Oh my GORGEOUS! The Levi’s are so good, and have my heart skipping a beat, but the fit on the Simhkai are absolutely perfect! So unique and fresh. I’m intrigued by the length on them, is this a new PPL standard for the new styles? Also, love the pearls with the hoodie! Those gold button jeans are outrageously awesome! Those are awesome! AND they fit you off the rack?!?!?!? How lucky! That hoodie is fabulous, too. I love the high rise Cig jeans with your white booties. So crisp..
Love the hardware on those jeans!! I love the Levis Wedgie on you - perfect fit. And the new cigarette pants with gold hardware are fabulous on you!! I did see the Carpenter jeans and they look so much better on you than in the stock picture. On you they look fashion forward and flattering - in the pic the model I am sure is gorgeous and in shape but the fit seems off. The Simkhai’s are so awesome. I looked around Shopbop to see if there was anything else similar in something close to my size. They had one pair of jeans in a 33, a basic pair of skinnies. There were some Monse jeans in a 14, but they were nearly $900, and definitely not that great. Wow! Both pairs look like they were made just for you! The fit on both looks incredible. You must be excited to wear these puppies! Wow! They both look like they were tailored for you. Perfect fit and gorgeous looks. 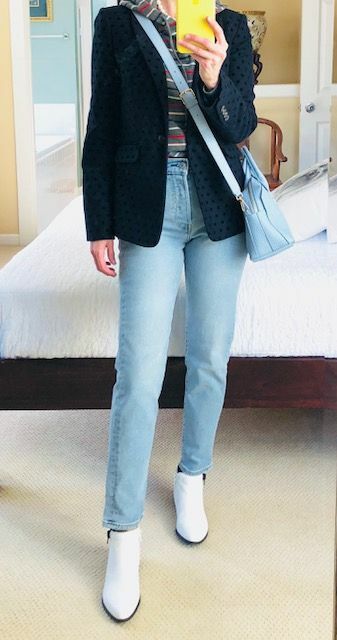 Love that your jeans match you bag - a whole new level of matchy matchy! Oh, those are awesome on you! The button ones are just brilliant. The Simkhai ones are so perfect for you- polished, hardware- gorgeous! And thanks for including the Boden hoodie in the pictures. I like it even more! These are amazing!! The gold hardware ones slay me. I want those with silver!!! On my phone but back to say more later. Wow! Totally fab. Matching light blue jeans to light blue purse is genius. What a trio of great jeans ! OH! Thanks for the awfully kind words. I'm blushing. Colette, the model is wearing the Simkhai's a little shorter, but I like the length they are on me with flat footwear. 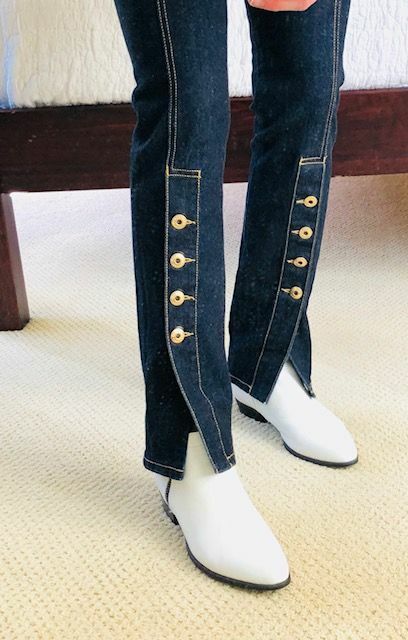 Not quite straight or bootcut - weird hybrid - regular length, but not floor scraping because of the front vents and narrower width of the hems. Unique. Avant-Garde. Anna, I wish Shopbop EXTENDED their sizes. Kathie, hoodie for you and Lisa p. It's a gem. Better with pearls! (Can't even begin to tell you how comfortable those Naturalizer booties are). Smittie, VERY excited. Flying in the Wedgie's tomorrow with Sam. Go Team Wear. Janet, I can enjoy the new high rise bootcut on YOU. Sal, JAileen, Merwoman, that's a sweet thing to say. Jaime and Jessikams, onward Team Matchy-Matchy. I am also going to try the Wedgies. I was afraid they would give me a literal one, and they might, but nothing ventured, nothing learned. Sizing up one size in the all-cotton fabrications seems to work for me, too. I think the regular size could be okay....but wouldn't be as comfy off the bat. I guess the stretching out factor will be apparent with continued wear. I do seem to recall that my 100% cotton jeans did stretch...but they didn't fall down, and would always tighten up again in the wash. Crossing fingers. You look superb in both of these and how fun that each new jean is so distinctive. That's key to a trendy upgrade, I think. You want each style to speak clearly and make itself known as what it is. Oh, I love the Simkhai jeans on you, just fabulous, Angie! Stunning! The gold hardware is amazing! I love the Boden too and jacket and so good the Furla bag tones so beautifully. Ooh, amazing! How much fun to change up your style this way. I wear a lot of jeans, and nothing freshens up my style like revamping the jeans. And there's so many interesting styles out there right now. Omg. Am in love with the pair with the buttons! Those light blue jeans are just fab on you and no one is going to miss you in the cig jeans!They are beyond fabulous.